The Society is pleased to announce our first annual leadership positions. 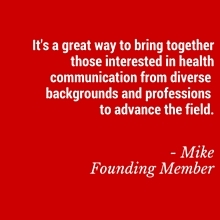 Selected from among our steering committee members, these individuals are helping the day-to-day work of advancing the Society and the field of health communications. Duties: Assist with the development and implementation of the strategic plan; provide direction and oversight for the annual National Summit for Health Communication, including the event theme and core programming. Tony also serves as Senior Vice President, Strategy & Evaluation at the Ad Council. In this role, Tony advises the strategic planning of more than 35 public service communications campaigns. Tony also oversees campaign evaluation, establishing key performance indicators and the tools through which they are measured. Moreover, he leads cross-campaign analyses designed to optimize Ad Council initiatives. Tony is also a leader of Ad Council Edge, a strategic consultancy advising nonprofit and corporate clients. Tony’s primary role is to leverage research-based insights into action, helping to ensure that the Ad Council remains a results-driven organization with a single-minded focus on making an impact in people’s lives. Prior to joining the Ad Council in 2002, Tony managed projects at Public Agenda, a nonpartisan public opinion research organization. He is a graduate of Swarthmore College and holds a Master’s degree in Sociology from Columbia University. Tony is a member of the Advertising Research Foundation, the American Evaluation Association, the 4As, and AAPOR, and serves on the steering committees for the the Market Research Council and the Fishlinger Center for Public Policy and Research. Duties: Provide direction for member services and membership management. Terry also serves as Vice President and Associate Director at Westat. An expert in research-driven communication, Terry is a vice president and associate director at Westat, managing a team that focuses on social marketing, digital/social media, information dissemination, communications research, product and campaign development and implementation, partner/stakeholder engagement, multicultural communications, and website and application development projects. Prior to her role at Westat, she served as vice president at Eagle Design and Management, Low and Associates, and Berns and Kay. She has served on the Society’s steering committee since 2017. Terry holds a Master’s degree in Communication from Johns Hopkins University and in Women’s Studies from George Washington University. She earned her Bachelor’s degree at the University of Virginia. Role: Identify areas for advocacy and provide oversight for committee activities. Lenora also serves as Director, Office of Science Policy, Engagement, Education and Communications at the National Heart, Lung, and Blood Institute (NHLBI). Lenora directs the science policy, engagement, health education, and public-facing communications initiatives of the National Heart, Lung, and Blood Institute (NHLBI). The office, referred to as OSPEEC, enables NHLBI to develop and provide accurate, scientifically-based, disease-specific, research-oriented, and evidenced-based information to stakeholders through the use of multiple media and digital platforms. Prior to joining NHLBI in 2013, Lenora was the director for communications and education at the National Institutes of Health’s National Cancer Institute. For close to 30 years, she has directed initiatives focusing on translating scientific information for use by those whom it stands to benefit most, supporting issues related to minority health, research dissemination, reducing health disparities, global surveillance of health risk behaviors, broadening states’ capacity for social marketing, and capacity-building for health promotion and public health education programming and health behavior risk reduction. She has extensive experience in working at the national and local levels translating health information into materials, messages, and interventions that reach vulnerable populations. Her programs have been implemented through the Lombardi Cancer Center in Washington, DC, the Directors of Health Promotion, the American Public Health Association, the Kaiser Permanente Health Plan, the American Cancer Society, and numerous partnership efforts with community-based organizations serving diverse constituents and stakeholders. Dr. Johnson’s research concentration is in behavioral sciences. She is trained in health promotion, health marketing, and communication science. Her practice emphasis is the application of theory and evidence in the development, implementation, and evaluation of communication and education.